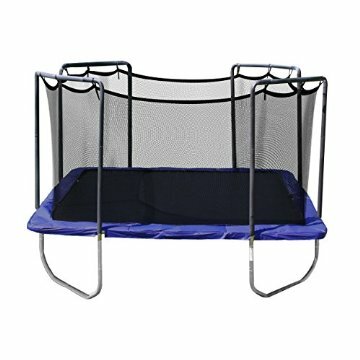 The Skywalker Trampolines 15-ft. Square Trampoline and Enclosure Combo is your kids' ticket to fun this summer. Safety is first of mind when it comes to Skywalker, so you can rest assured whenever kids are jumping. The frame rails are 2.4 inches in diameter with extra thick 16-gauge rust-resistant galvanized steel wall thickness, offering real sturdiness. Welded t-sockets secure the enclosure frame to the trampoline frame, which eliminates frame twisting and strengthens each frame joint. The stay-put enclosure net interlocks to the jumping mat by using a patented button-hole feature. This attaches the enclosure netting to the jumping surface at each v-ring, away from the springs and frame and eliminating gaps. For ages 6 and older. Store: shoppingmart_llc Condition: Brand New Price: $379.99 Total Price: $379.99 Buy It from shoppingmart_llc No returns.